When Tinker Met Bell is the perfect cute paranormal romance to pick up for Valentine's Day! Find out how Tinker and Bell get around the pesky curse that keeps their species from getting together. Includes heroic antics in otherworldly settings. You can also pick up the newest novel, Besphinxed, for Heather's redemption story. 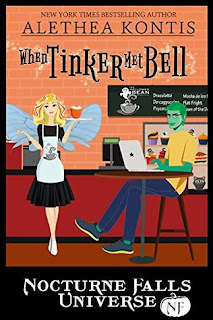 I really enjoyed When Tinker Met Bell when it first came out and immediately gave a five-star review on Amazon, but had a bit of a hiccup with scheduling this post on my blog. Now there are more books in the series you can pick up--I've enjoyed them all! The Truth About Cats and Wolves makes a great introduction to the series, and they all also work as stand-alones. What a great Valentine's Day binge!